WILLEMSTAD - Curaçao's Carnival is one of the largest and longest-lasting Carnival spectacles of the Caribbean and one of the best times to visit the island. Carnival began as a Catholic rite to represent the Christian practice of “Carne Levale,” or giving up meat for Lent. 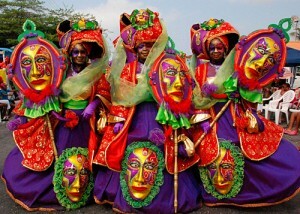 In the 19th century, Curaçao continued the tradition by organizing masquerade parties and marches in private clubs. It wasn’t until 1969 that Curaçao Carnival! started to gain the popularity it enjoys today. The main marches, the product of weeks of enthusiastic preparation, take place in February or March. They feature hordes of fantastic floats, costumes, and characters, plus Carnival royalty elected during full-scale beauty contests. There are two big parades, one on Sunday in the daytime — Curaçao’s Gran Marcha (“The Grand Parade”) — and the Marcha di Despedida (“the Farewell March”) a couple of days later, on Tuesday evening. The latter has a special magic — floats are adorned with sparkling lights and at the finale of the parade at midnight, the Momo (a big straw-filled doll) is burned. Carnival celebrations usually last until the eve of Ash Wednesday. Carnival Queen – Represents Mother Earth, the symbol for fertility and peace. Carnival King (King Momo) – As a symbol for infertility, sins and bad luck, this straw-filled king is burned in a spectacular ritual at the end of Carnival. Prince and Pancho – Carnival’s boisterous energy stands out next to these two "city leaders". The Carnival route starts off in Santa Maria and always goes through Otrobanda. Arrive early to get a good spot, and ask your hotel concierge about special seating for tourists. If you want to dance and mingle with the locals, stick to the streets. The crowds are generally friendly and family-oriented. And if you get the chance to join the parade, definitely take it! It’s an experience of a lifetime. And most important of all — don’t forget your camera! Apart from children and adult activities, Carnival festivities include special festivities for teens as well. They also have their own tumba contest, their own Queen of Carnival, King, Prince, Helper Pageant elections, and their own parades. In these parades, secondary schools demonstrate their abilities, designing their own costumes and a special dance performance. The first Teen Curaçao Carnival parade takes place the Friday before the adult parade. The farewell parade takes place, together with the children's parade, on Monday evening, the day before the big farewell March. Even Curaçao’s kids present their own version of Carnival. Just like the adults, they have their own Queen of Carnival, King, Prince, Helper Pageant, and Farewell Parade. They also have their own road march election. There are two children’s parades: the first on the Sunday before the Gran Marcha and the second — the Children’s Farewell Parade — on the Monday evening following the Gran Marcha.